Watching the clock may not be encouraged in work places but at Chatham they actually pay you to watch the clock! The spacious boutique recently opened its doors to customers who are on the lookout for exclusive luxury watches in town. Housing some of the finest brands in the market: Cartier, Omega, Jaeger-LeCoultre, IWC and Chopard, Chatham is the joint venture of two of the top brands in Sri Lanka: Sifani Jewellers and Hirdaramani Group. "We have known each other for a long time and since the country is looking towards development we felt that the retail sector needs to be enhanced. Luxury retail enjoys success all over the world. Sri Lanka too can reach that level. According to our research the luxury watch market has a huge potential to expand in this country," Hirdaramani Group Director Siddarth Hirdaramani revealed the roots behind the inception of the duo's multi-brand luxury watch boutique. He noted that these particular brands were selected to cater to different customers. Cartier is widely known as a jewellery watch. It has adorned the wrists of celebrities and royalty for generations. Chopard embodies the splendours of the imperial age and is made using the state-of-the-art technology. 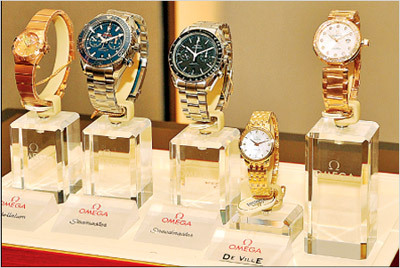 Omega has been popular in Sri Lanka for the past decades and includes a range of ladies and mens watches. The brand has been associated with advances in sports timing, precision technology and design, and most notably, James Bond. IWC and Jaeger Le Coultre too comprise a range of stylish and pilot's watches. All these timepieces have their own unique imprints and are aimed at catering to locals as well as tourists. "Moving to watches an extension from the jewellery sector. Our expertise in the field came in handy when installing this setup. Stores of this nature benefit the tourism experience. Tourists are not only encouraged to enjoy the beautiful landscapes but also to spend money at the high end stores in Sri Lanka," Sifani Jewellers Managing Director Rizvan Sahabdeen noted. He said that they have had encouraging signs from the Indian and Chinese consumer market. The location of the store at Galle Face Court 1, is an added bonus since many tourists venture to the area. Each of the luxury collections featured at Chatham have been in existence for more than hundred years and are considered the most magnificent of Swiss timepieces. Directly imported from Switzerland the watches are priced from Rs 300, 000 and upwards. A Cartier priced Rs five million is the most expensive watch that they possess at the moment. Three of the brands which make up five of the top export watches in Switzerland: Omega, Cartier and IWC are available at the boutique. Customers are also given the opportunity to place custom orders for one-of-a-kind watches or for pieces that are not currently available within the signature collections at Chatham .